As one of Singapore’s oldest estates,Queenstown is steeped and deeply embedded in the history of Singapore. 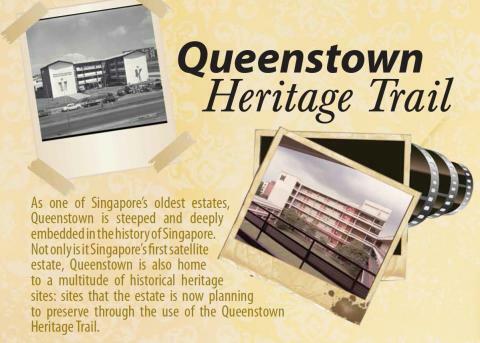 Not only is it Singapore’s first satellite estate, Queenstown is also home to a multitude of historical heritage sites: sites that the estate is now planning to preserve through the use of the Queenstown Heritage Trail. MDIS is proud to be part of Queenstown’s HeritageTrail, and to pay homage to one of Singapore’s oldest and best tertiary institutions. Running through 38 heritage markers, 11 heritage galleries, six neighbourhood heritage corners and a S$2 million museum (set to be unveiled by 2020),the Heritage Trail will feature interactive spaces withphotographs, artefacts, 3D displays and stories fromresidents. The MDIS Stirling Road campus is one of the 38 landmarks located on the trail. Located on the site of the former Baharuddin Vocational Institute – Singapore’s first tertiary school dedicated to manual and applied arts – the institute was officially opened by then Prime Minister Lee Kuan Yew in 1965. The Institute eventually closed its doors in 1990, and in 2004 MDIS officially tookover the premises, transforming it into a state-of-the-arttertiary educational institution. MDIS is proud to be part of Queenstown’s Heritage Trail,and to pay homage to one of Singapore’s oldest and best tertiary institutions. "MDIS is proud to be part of Queenstown's Heritage Trail, and to pay homage to one of Singapore's oldest and best tertiary institutions."